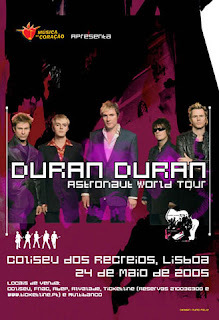 Nuno is also creator of the official fan page for Duran Duran in Portugal (www.duran.com.sapo.pt). Kirk, DDTTRH: Nuno—I got a chance to look at your amazing art at Studio N45. I really like the Nick Rhodes Astronaut piece and the signed version of a Duran Duran poster you did. I also like what you did for DuranDuranFans.com. Can you tell us a couple stories about your art, where its taken you, and some amazing experiences you’ve had because of it? Nuno: Wow. What a good way to start an interview. Thank you so much for your comment. In fact, during all this “duranyears” I collected a lot of amazing stories. 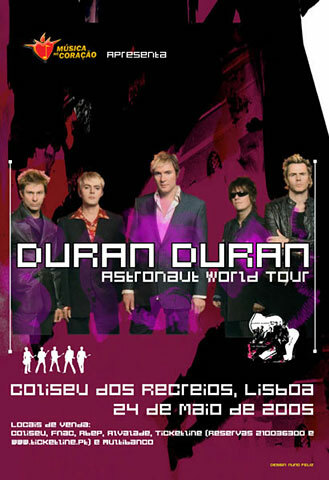 The most import for me was the one regarding the oficial poster I did for the Lisbon gig in 2005. At that time I got in contact with the promotors of the show and sent them a design ideia of the poster. They were amazed and ask me to make the oficial poster. The only thing I asked back was to meet the band and … it was a dream came true! Before the show I met the fab five and by surprise, John looked at me and said “so, you are THE nuno” …. No words! I believe that this poster is the only one on duran duran career done by a fan. 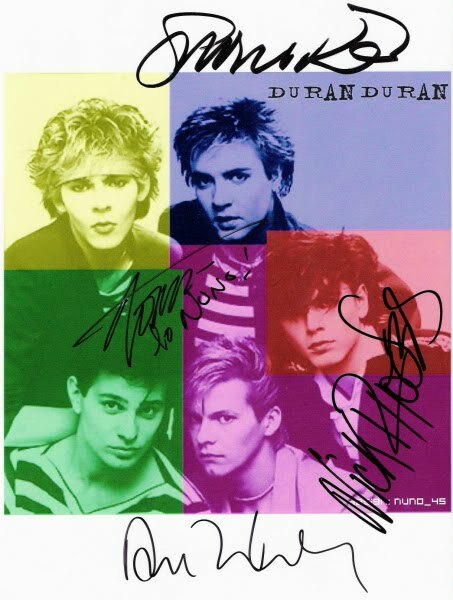 There are also stories of duranies asking me to use my design on t-shirts and some were already signed by the band. I also saw some cover sleeves I did signed by them. 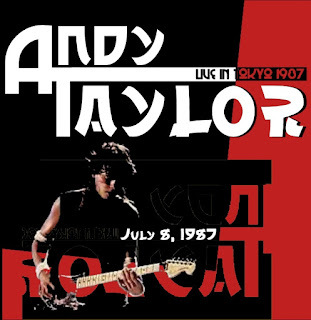 Making the intro images and design layout for www.andytaylor.com; wallpapers and other designs for tigerbeat.nl and duranduranfans.com were amazing experiences to me … something that I will never forget. Nowadays, I contribute with some designs for Andy site. Kirk, DDTTRH: How long have you been a fan of Duran Duran? What has inspired you about them throughout the years? NUNO: Fan since 1980. Their music is an inspiration source … it’s so visual. Yes, the videos helped a lot and also the great cover sleeves. All of that...it’s a kind of art school to me. I believe that the teachers are proud with my “work”. 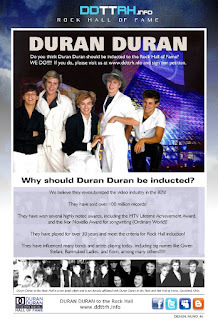 Kirk, DDTTRH: Tell us more about what you are doing with Duran Duran Portugal! NUNO: This journey started in August 1999 when I decided to show to the world via web my fascination for this amazing band that keep making the soundtrack of my life. The site “Nuno’s Homepage – portuguese duran duran site” www.duran.com.sapo.pt was a big surprise to all the portuguese duranies because it was a web full of updated information with a “duranic design”. It was a way to promote DD in my country and all over the world because the site was/is a reference in the world wide web. So, everytime that there is an album out or a concert near … believe me that there are much “underground work” of promotion done by me. For instance, in 2007 I manage to provide a listening session of RCM at SonyBMG a few days before the release of the record. Apart from that, during all this years I keep giving feedback directly with some band members. 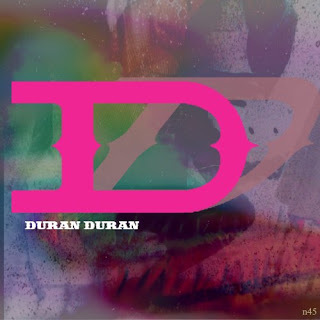 Kirk, DDTTRH: I noticed that most of your on Studio N45 is on Duran Duran, however noticed work on other 80’s artists like Flock of Seagulls, Prince, Spandau Ballet, and Pet Shop Boys. What are some of your fond memories of the 80’s? Kirk, DDTTRH: Do you graphic design professionally as well? What motivates you about it? NUNO: I am a civil engineer but I always wanted to follow a design career. In the beginning of I designed the cover sleeves for my DD bootlegs collection (I hate bootlegs without covers) and now this, with the wallpapers, started to be my favourite hobbie. It’s something that I really enjoy doing. In 2010 I had the opportunity to make some professional works for a promotions company. I did the graphic design work for the concert of Alphaville, A Flock Of Seagulls, God Save The Queen, etc..
Kirk, DDTTRH: Am I right that Studio N45 is a play on the famous Studio 54? Tell us more about how you came up with this name. NUNO: It was a happy coincidence. I always had the idea of making a web with all my “work” and the best way to show it is in a Studio. N45 is Nuno 45...my nickname in the duran duran world. Why Nuno45? That’s another story. Kirk, DDTTRH: Have you signed the DDTTRH petition yet? Any special message you’d like to share with DDTTRH fans? NUNO: Yes. 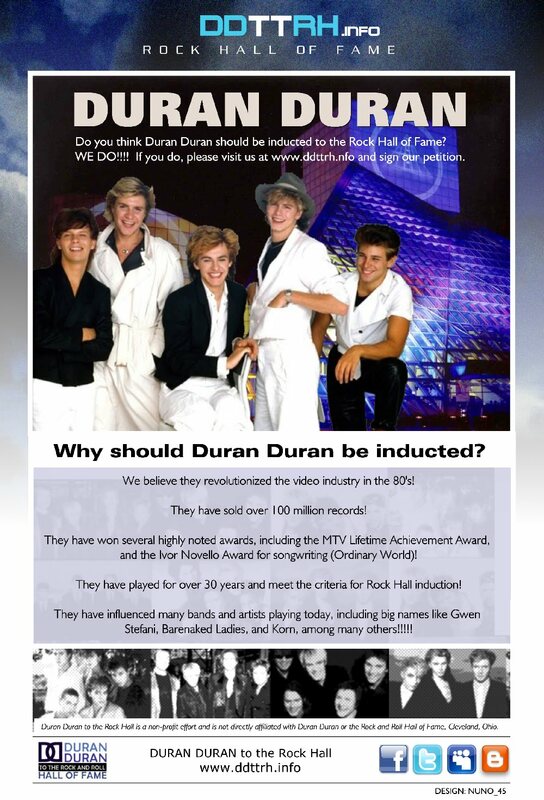 The message is simple … only we (duranies) can put DD at TRH. ALL YOU NEED IS sign the petition NOW! Let’s make 2011 a memorable duran duran year.